Our daughter Heather and the team from Eagle Creek Church are back from Nashville. It was hot, hard work, and Heather’s arms and legs are still sore. A couple of times while working, she got light headed from the smell and the heat, and had to sit down. But they completed the mission they went there for, and she is glad she went.twitter.com/eccfloodrelief). She has a busy week, teaching zumba aerobics tonight and helping today and this week with kids’ Vacation Bible School, so please pray God’s rest and strength for her. 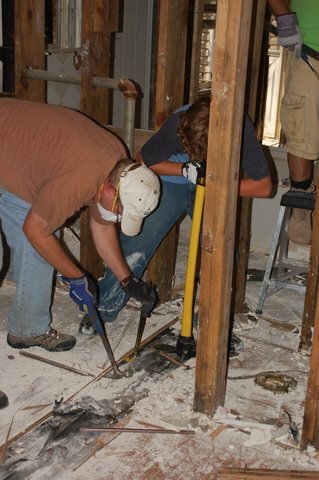 On the mission trip, they gutted the house, leaving the results up to God (they don’t know if it can be salvaged or not). Heather and a team member were able to pray with and encourage an older man who had just lost everything he had in the flood. Hello family and friends! Many of you know that I went with my church last week to Nashville, TN July 28-July 31. 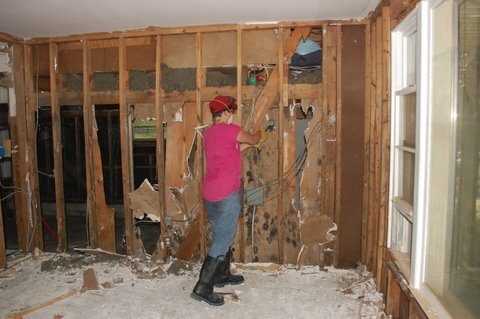 We went to help Anchor Christian Fellowship do demo at a house that was damaged in the flood. To prepare for my trip, I received a tetanus shot the week before, but I hadn’t had one in 14 years, so it needed updating anyway. Our team of 8 left Wed. night after work in one car and one truck. There were 3 women, 4 men and one teenage boy that went. We arrived to our hotel 3am Thur. and then were up to work at the house by 9am. It was a very hot day, so we only worked til about 2pm. I’ve never sweated so much in my life! 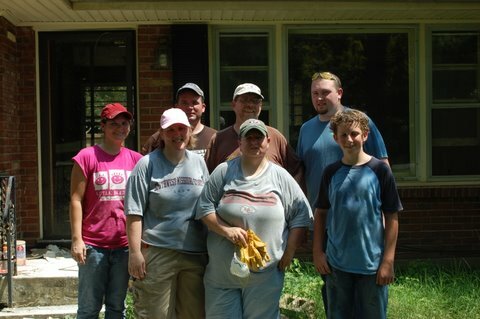 The house we were working on was owned by a woman that we had hoped to meet and interview, but didn’t get a chance to. She had lost EVERYTHING because the water was up to her roof! We’re not sure if the house is salvageable, but in order for the insurance to even consider it, it had to be gutted. We tore down walls, tore up the wood flooring and sub-flooring, etc. Because of the damage, there was lots of mold, so we had to wear respirator masks, gloves and boots. I personally wore goggles, too. We then went back to our hotel to shower and rest before eating dinner at 6:30pm. 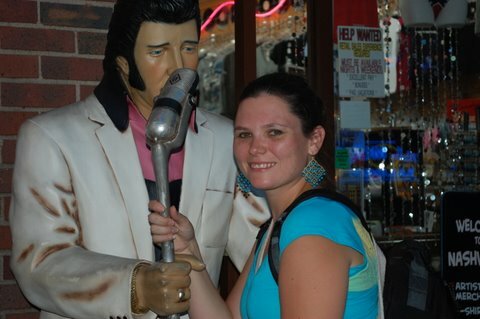 The plan was to go out as a group, but the guys were so wiped out that they just ate dinner on their own and stayed at the hotel, while we ladies toured downtown Nashville and got back around 11:30pm. We had a morning devotional on Fri. at 8am based on Matt. 5:13-16. Our team leader, Mike, encouraged us that even though it may seem like what we’re doing physically is a “waste”, it’s not spiritually because the reason we came was to be a light and salt to Nashville and show that we care. We worked til about 3pm and then went back to the hotel to shower and rest. We then all went downtown as a group to eat and then go to a worship concert at Anchor Christian. Some of us stayed in downtown to do some shopping and pics, then headed back to the hotel. We checked out and headed on the road by 9am Sat. A neat story I have is that I was able to pray for an older man at the hotel before we left, so I felt that completed the trip for me. As I sat in church today thinking of the people we encountered while there, I began to well up with tears. I can’t imagine having to go through that type of disaster and losing EVERYTHING we have and feeling hopeless. One man we encountered actually came to the house while we were working on it and told some of us his story. I didn’t hear everything, but what I do know is that a year ago, he had lost his wife to cancer, I believe. Then this year, he lost his income of 3 rental properties due to the flood. He had a very hopeless look in his eye and I wish we had prayed for him, but a team member told me she tried and he was resistant. I prayed for him anyway in my mind. I do believe him and the other people were thankful for us coming, though. Anyway, I’m VERY thankful that I had the opportunity to go on this trip and I do believe it’s the start of many more to come. I’m VERY thankful for the new Missions Pastor and his family at our church, so that our church can get more involved in missions, both local and foreign. Thanks to everyone who thought or prayed for us. As soon as I have access to the interviews, I will send it your way. For now, you can look at the live footage on twitter and see the attached pics. P.S. I do want to make a special shout out to our parents and Kyle for allowing me to go. The Lord will bless you for helping me with the girls, and dad, thanks for the boots!